Optimal connections right from the start. As the most expensive and heaviest single part of an E/E architecture, the wiring harness offers enormous potential for optimization and cost savings. PREEvision supports development engineers in finding cost-optimized designs. Via VEC or KBL import, existing designs can be frontloaded. The wiring harness router and variant management facilitate the comparison of alternative designs. Automatic calculation of cable lengths, weight, costs etc. PREEvision helps wiring harness engineers to find cost-effective wire and cable assembly designs by providing multiple modeling layers with dedicated tables and diagrams. PREEvision’s wiring harness design workflow supports the comprehensive development from architecture design to series production. To be able to compare alternatives, optimize the design and ultimately develop the wiring harness in detail, PREEvision provides the modeling layers of the hardware network topology, the electric circuit diagram, the wiring harness and the vehicle geometry. Additionally, PREEvision provides special tools such as a wiring harness router, import and export functions via VEC or KBL or the power calculation that is important for architects. Hardware topology: Modeling hardware components and their connections. For the basic hardware architecture, components such as ECUs, sensors and actuators can be modeled as well as the connections between the hardware components. Circuit diagram: Refinement of component connections with power supply, ground and currents. In the electric circuit diagram, hardware components and their connections are refined through the description of the electrical characteristics and the definition of the power supply and ground. Integrated circuit synthesis automatically generates schematic connections and spares the developer from having to carry out error-prone activities. PREEvision provides hardware modules and components such as fuses and resistors for modeling the internal electrical design of components. The power calculation of PREEvision determines the static power consumption of a component network in various different operating states. The required diameter and materials for cables and pins, for example, can be determined based on this. The vehicle geometry can be imported from a 3D KBL file to PREEvision. The vehicle geometry can be modeled or imported from a VEC or KBL file. In the geometry diagram, routing paths, installation locations for components and connector locations can be defined. In PREEvision, installation and connector locations must be connected via so-called mappings with E/E components and wiring harness connectors. This design step connects the wiring harness layer and the geometry layer and is prerequisite to use the wiring harness router. Wiring harness diagram: Refinement of connections in physical wires, leads, plugs and splices. Based on an electric circuit diagram, PREEvision can synthesize a wiring diagram with connections and pins which can be refined with details such as leads and cables. The wiring harness layer contains all wire connections, connectors, splices, isolation points and pins. 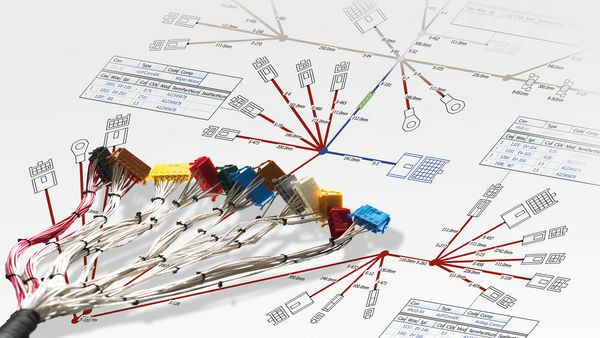 If the connectors of the wiring diagram are mapped to connector locations in the geometry, the wiring harness router can calculate the optimal routing via wiring segments as well as the needed isolation points. As final steps terminal determination and adaption of the wiring harness follow for production-readiness. Typical harness diagram as PDF or image file including connector locations. This diagram shows the wiring connectors at the end of the segments including detailed pinning information. Typical wiring harness diagram as PDF or image file including connector locations. PREEvision supports the VDA exchange formats VEC (Vehicle Electric Container) and KBL ("Kabelbaumliste", meaning: "Harness Description List") for exchanging manufacturing master data, circuitry information and geometry data. PREEvision supports VEC or KBL for import and export of harness design data or geometries (2D and 3D). Additional data needed for smooth collaboration between OEM and suppliers can be provided via reports. The predefined report templates can be easily modified and adapted to specific needs. Automatic and editable checks help to develop a consistent model. Reuse of single components or bigger parts of the model to minimize redundant work. PREEvision’s inbuilt scripting environment with full read/write capability in the data model allows customers to develop their own analyses using the data contained in their model and also allows customers to automate, and thereby streamline, their modeling process. Reuse and further development of parts from previous projects as new revisions or part of a new branch. The integrated change management provides functions for assuring controlled and structured implementation of change requests. It supports efficient and consistent follow-up of change requests and errors for all development artifacts. PREEvision therefore supports the handling of tickets, including their linking to the technical artifacts. Life cycles in PREEvision enable management of work flows that is tuned to the specific organization. Development of a 150% model including all available functions and their corresponding components. Different product variants are tailored and managed as subsets. Define and easily set up tables and table editors to represent exactly the data needed for a specific task. Handwritten corrections on printouts, giant spreadsheets, and countless tool changeovers: these and similar approaches are used in an effort to keep a handle on the development of a vehicle wiring system. More efficient approaches are needed to control the complexity of modern electrical distribution systems in the long run. The model-based development methods already in successful use in many industrial sectors provide the needed tool for this. Translation of a German publication in "Elektronik automotive", special issue S4/2016 "Bordnetz"
In this webinar our product manager explains PREEvision’s modeling layers of the hardware network topology, the electric circuit diagram, the wiring harness and the vehicle geometry. Additionally, special tools such as a wiring harness router, import and export functions via VEC and KBL or the power calculation are shown. Get to know how PREEvision supports model-based harness development and how cost-optimized wiring designs are defined in detail. On 22 pages, the new PREEvision brochure portrays the complete E/E engineering solution and its comprehensive functions.